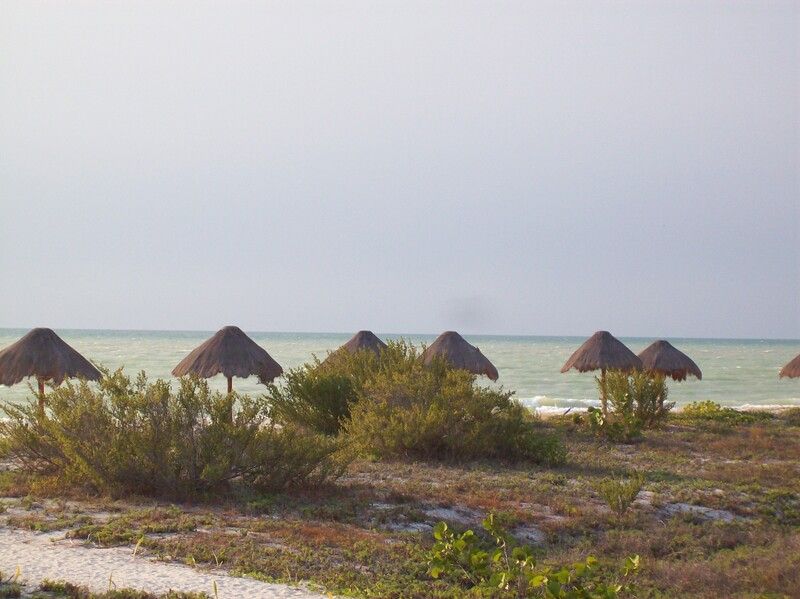 Celestun is on the Gulf of Mexico side of the Yucatan Peninsula where the water is emerald green. It was one of our stops on our honeymoon and you get there by going through Merida, which is the largest city and also the capital of the state of Yucatan. 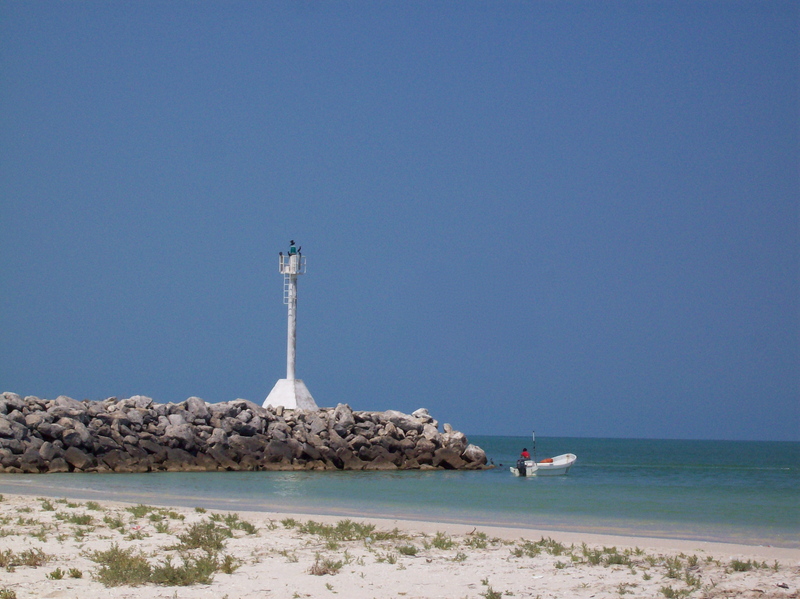 Once you arrive at the tiny fishing village of Celestun turn north and drive 10 kilometers on a gravel road to the resort, Eco Paraiso Xixim, which is actually an ecological hotel. I must be honest: never in a million years would I have thought to visit Celestun. But Steve in all his birding wisdom discovered during his research that we needed to go to Celestun. In Maya, the name Xixim means sea shell and the unspoiled beaches at this resort have a bizillion sea shells. The hotel grounds were conscientiously designed to be self sustaining. In other words, they take caution not to spray the mosquitos. But bad for me, as mosquitos just love me to pieces. The Hacienda Chichen, where we had stayed the two nights previous, was glorious and like the Garden of Eden. Eco Paraiso was a different sort of paradise. There are only 15 cabanas and the beach was peaceful. We lounged in our hammocks on our veranda. We swam in the ocean, laid out on the chaises on the beach under straw thatch umbrellas, or swam in the hotel pool with the waterfall and drank smoothies on the cushioned chaises as we played Scrabble and watched the sunset. The food was authentic Mayan and we took advantage of the pool table in the restaurant There were no TVs (except during certain hours in the common area) and no phones in our cabana. But the cabana was spacious and the high thatched-roof ceiling gave us the feeling that we were staying in a large house. The mosquito netting over the bed looked romantic, but it was for practical purposes, natch. (Those pesky mosquitos.) And every cabana had a fantastic view of the Gulf of Mexico. 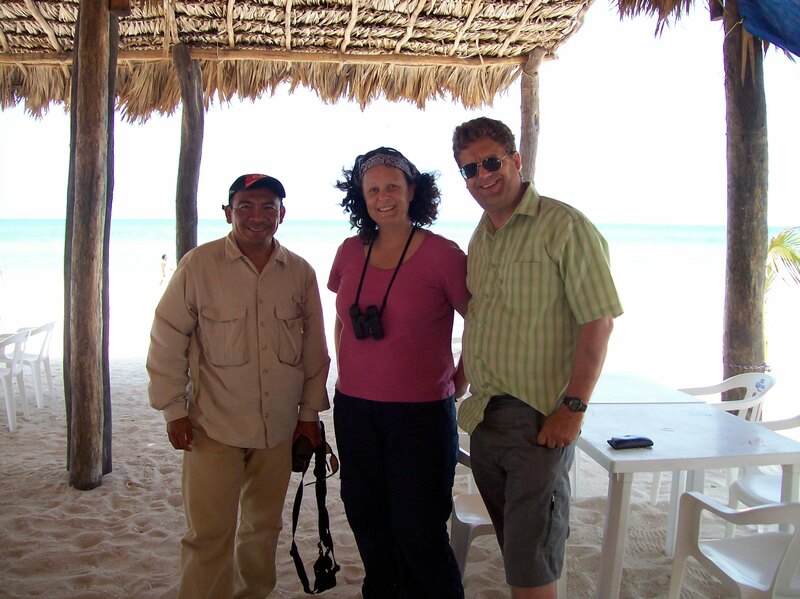 Steve had pre-arranged for a bird tour with one of the best birding guides in all of the Yucatan. One morning we met David, our guide who took us to see the Flamingos, which were flying over us like busy traffic, going back and forth from their food source and their nests. This also was my first experience birding at a landfill. Yes, birders are fond of landfills as they attract all sorts of birds there. Blech. At lunch time we stopped and had fish at one of David’s favorite restaurants and we enjoyed getting to know him better. Turns out he used to teach English and History as a high school teacher in Celestun. Now he lives in Merida and does birding tours full time. He told of us his concern of the children in Celestun who don’t finish their education, worried that they’ll go right into fishing. “That’s not sustainable,” he said. 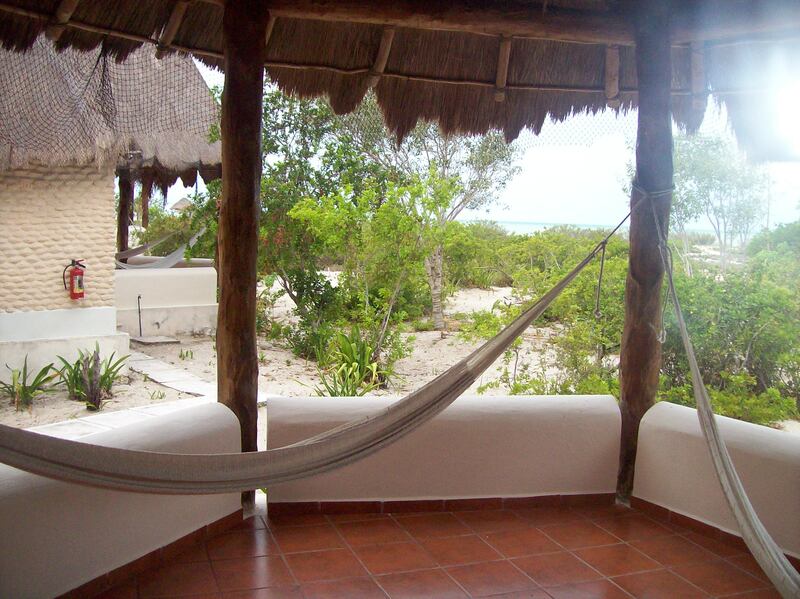 It would be difficult to be burdened by your troubles at Eco Paraiso. The daily siestas were growing on me, and I completely forgot that I had a job waiting back for me in Utah. If there were any cobwebs in my head they were gone. The simplicity of the resort makes everything else seem simpler. Everyone at the resort was extraordinarily hospitable and concerned about our well-being while we were there. We stayed at Eco Paraiso only two nights but Steve had to practically drag me from the place. I didn’t want to leave.